David Mazouz in the "Pax Penguina" season premiere episode of Gotham. Young Master Wayne is ready for his closeup. In tonight's Season 4 premiere, "Pax Penguina," Gotham gets right to the point that, yes, Batman is coming. And David Mazouz (Bruce Wayne) couldn't be more excited about his character's path to the cowl. "I feel like Bruce really has evolved in a major way. We pick three months after Season 3 ended and within that time, Bruce has been vigilante-ing out on the streets. And, of course, that's going to change a person. That's going to make them more tough, more raw, and that's exactly what Bruce is now." Not that he's all grim and glowering, despite the black mask and flowy coat he wears while dispensing back-alley justice. 'I love when I get to do something different. That includes kissing scenes,' says David Mazouz (Bruce Wayne). "A big, big reason why he's doing this vigilante thing is because it's fun," continues Mazouz, who seems to have physically grown another foot in the opener. "Bruce is doing it because he's having the time of his life. As a teenager, he wants to just have fun, do what he wants to do, like most teenagers; I can very much relate to that myself. And that, obviously, is not why Batman does it." Hinting that "a very traumatic experience" will lead Bruce makes to make a decision "that will change his life—his entire life—forever," the 16-year-old actor reveals that his fledgling crimefighter's nocturnal activities will divide the key players in town, including two of his previous allies. "Bruce's mission gets in the way of his relationship with Selina (Camren Bicondova) and he has to choose between the two. And not just Selina, it also happens with his relationship with Gordon (Ben McKenzie)." Never miss your favorite shows from Fall's new line-up. But before then, there are some serious problems he and the good guys have to tackle. In tonight's lively, swiftly paced hour, we find that Penguin (Robin Lord Taylor) has not only returned to power as Gotham's kingpin, he has also instituted a program that allows criminals to do their thing as long as they have received a license from him. This means great screen time for a bulk of the ensemble's baddies, including Tabitha (Jessica Lucas), Zsasz (Anthony Carrigan) and Ivy (Maggie Geha), as well as new addition Jonathan Crane (Charlie Tahan), whose Scarecrow gets one of the wildest and most nightmarish introductions the show has ever staged. In addition, the new rule of lawlessness places Jim in the position of having to watch his city fall apart (again) as his less ethical colleagues sit back and let the villains run amok. 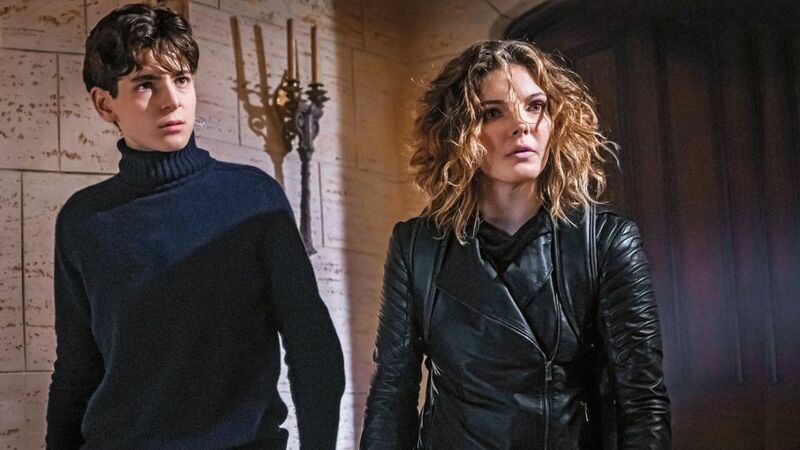 Like a comic book come to life, the episode sets up so much juicy storyline and sends Mazouz's Bruce into such challenging new territory that the season already feels worthy of its "Dark Knight" tagline. In this exclusive clip from tonight's return, the newly confident (and stealthy) Bruce bring important info to Gordon, who has once again run afoul of his own CGPD peeps for standing up for what is right.